John Hunter Nemechek and Cole Custer will lead the field to the green flag. Christopher Bell will start at the back of the field in 38th after failing to make it through inspection ahead of qualifying. The Whelen Trusted To Perform 200 is a 200-lap event. Green, they run even through the dogleg. Nemechek drives it deep into turn one. He slides up the track and makes light contact with left front with Cole Custer. Akinori Ogata is around behind them, the caution is out. Green, Allgaier cuts the dogleg from row two. He runs even with Nemechek into turn one. Nemechek holds the lead out of turn two as Allgaier drops into 2nd. Lap 20, Justin Allgaier is on the bumper of race leader Nemechek with lap traffic ahead. He downshifts in turn three. Allagier holds it lower off turn four. He cuts the dogleg and completes the pass. Lap 30, Christopher Bell is up to 11th already. He started this race at the tail of the field! Elliott Sadler is in his last full-time season. He’s looking for a championship spot but Sadler has picked up some right front damage. 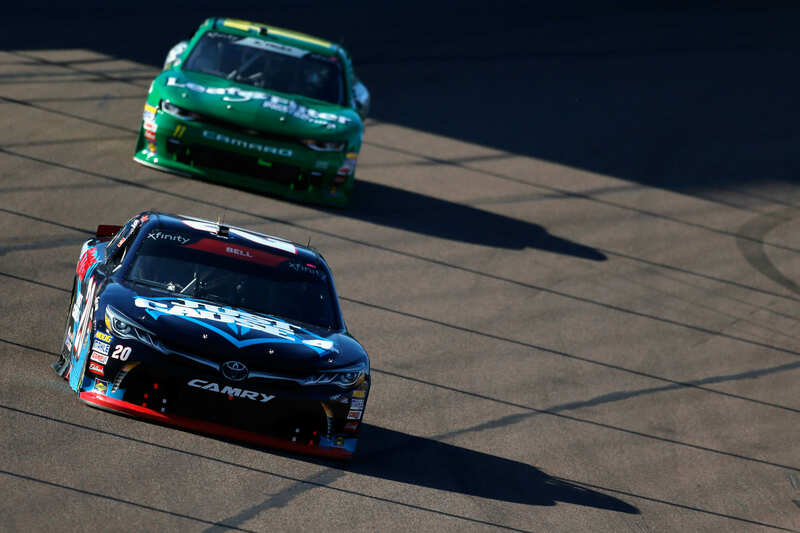 Justin Allgaier wins stage 1 in the Xfinity race at ISM Raceway! Bell climbed all the way to the top 10. The field heads for the pit lane. Austin Cindric wins the race off pit road, Allgaier crossed the pit exit 2nd. Green flag on stage two, Cindric selected the outside lane. It doesn’t work. Allgaier cuts the dogleg and he’s clear into turn one. Nemechek takes 2nd away from Cindric. Lap 62, Christopher Bell has cracked the top 5. He’s still on his way to the front. 6 to go in stage 2, Bell is on the bumper of Nemechek for 2nd. The tires are worn on Nemechek. Bell lifts and Cendric pounces. Bell and Cendric rub doors for 3rd off turn two. “I so wanted to wreck him,” Christopher Bell radio. “I’m not going to get pushed around. I’m done with these guys,” Austin Cindric radio. Justin Allgaier has swept the race so far. He wins stage two in the NASCAR Xfinity event in Phoenix! The field heads for the pit lane. John Hunter Nemechek is off first. Allgaier is out in 5th. Green flag on the final stage, Austin Cindric give a huge push to Christopher Bell on the outside lane. Bell gets sideways and looses ground through the dogleg. Allgaier cuts the dog leg and runs three wide for 2nd into turn one. Allgaier can’t get the power down as he’s all the way on the apron. Bell is on the gas around the top. He carries that momentum to 2nd off turn two. They spilt Allgaier off the corner as he falls to 5th. Lap 107, Christopher Bell is on the bumper of the leader. He has a run off turn four. Bell holds it on the bottom and Nemechek wiggles up the hill. Bell cuts the dogleg and completes the pass into turn one. Lap 136, Tyler Hill is sideways on the backstretch. That’s directly ahead of Alllgaier. The field jumps on the brakes and they all work around him without contact. The field heads to the pit lane. Bell is first in and first off. Green flag, Bell gets the jump on Hemric. Tifft gives him a shove, Bell is sideways but he remains on the gas. Bell leads and Tifft moves to 2nd. Lap 145, Ty Majeski is sideways as he comes across the nose of Shane Lee. At the same time, Nemechek gets sideways off turn four. Reddick gets into the back of him as he slows and that turns Nemechek into the right front of Allgaier. Two accidents at once. Allgaier has heavy right front damage. He heads to the pit lane for some tape. Green, they run three wide on the apron of the dogleg! Still three wide into turn one. Bell noses ahead through the middle. Hemric can’t hold it on the bottom, he tags Tifft in the left rear, they both continue. 46 to go, Hemric has climbed to the bumper of Bell. Slow car on the apron, the caution is out. Green, Tifft gives a huge push to Bell on the inside line. Tifft gets sideways through the speedy dry. Bell noses ahead into turn one. Allgaier is trying to climb through the field with the torn right front fender. The #7 car is 7 points out of a championship spot and he’s currently running 7th. 20 to go, Justin Allgaier is dropping through the field. His right front is on fire. The brake pedal has gone soft. 11 to go, Bell has just put Allgaier a lap down. Bell leads Hemric by 1.7 seconds. 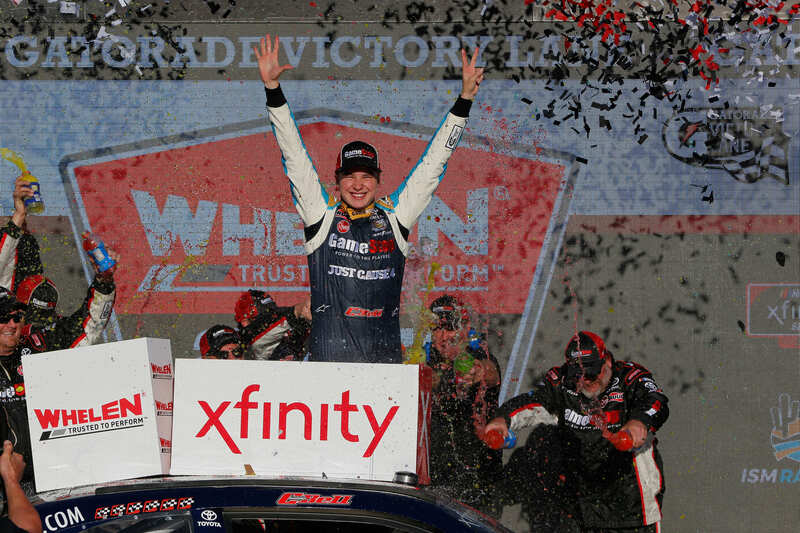 Christopher Bell needed a win to make it to the championship race at Homestead. He just drove from the back of the field. 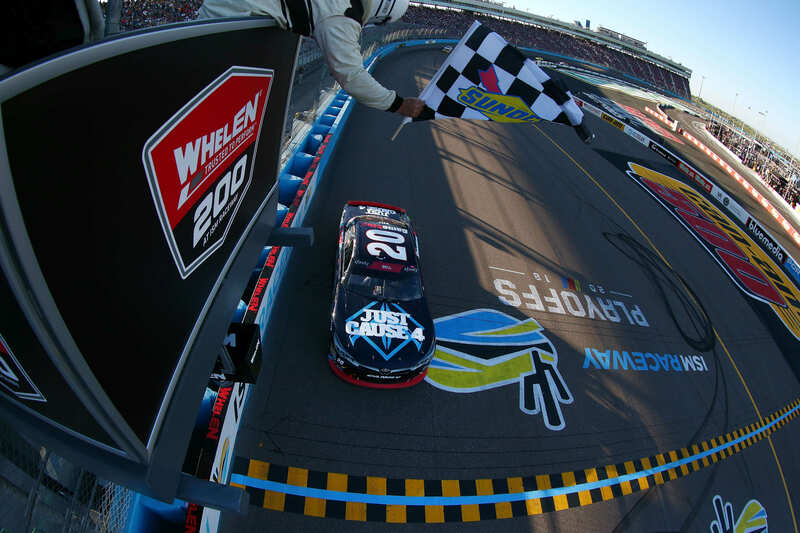 Christopher Bell wins the NASCAR Xfinity Series race at ISM Raceway! 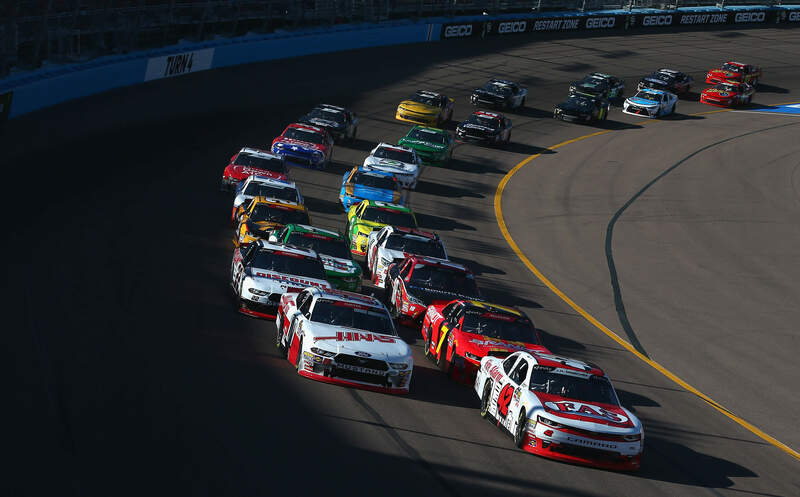 View full NASCAR Xfinity race results from ISM Raceway in Phoenix, Arizona below.